Has been sitting in a desk for a while but was working before. SMALL COMPACT HP PROBOOK LAPTOP. HP PROBOOK LAPTOP. FRESH INSTALL OF WINDOWS 10 READY FOR NEW USER TO USE. 14" WIDE SCREEN. DVDRW DRIVE INSTALLED. DP & VGA OUTPUT. X 3 USB PORTS. WIFI:BUILT IN. A little scruffy and a few marks on the outer cases as to be expected. Hard Disk: 500GB SATA 5400rpm. OS: Windows 7 Pro (Genuine). Lenovo Ideapad 310-15ISK. 1TB Hard Drive. 4GB DDR4 RAM. WiFi, Bluetooth, Optical Drive, HDMI, VGA, 1xUSB 3 and 2xUSB 2 ports, Ethernet, Headphone, SD Card slot. Brand: HPProcessor: Intel Core i5 4th Gen.
Cheap Dell Latitude E5420 14.1 Core i3 Laptop 8GB RAM SSD Windows 10 PC When you need to take your office with you, the Dell Latitude E5420 laptop can perform wherever you need to work. The newly redesigned Latitude E5420 offers productive mobility with its 14.0” HD, WLED screen that is ideal for professionals looking for a budget-friendly blend of mobility and at-your-desk computing. Ready for whatever your work might dish out, this highly durable laptop is stylishly armored top to bottom with a hard-wearing Tri-Metal casing, a brushed aluminum display back and reinforced, barrel hinge for strength and greater stability. 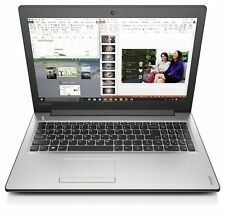 Lenovo IdeaPad 310 15.6" 1TB HDD Intel Core i3 6th Gen 2.00GHz 4GB DDR4 Laptop . Condition is Used. Normal marks from use. Some marks on lid, some marks around keyboard but nothing major - one screw is missing from base. This Laptop is coming with: Intel i3 2.0Ghz 6th gen processor ! not the old generation Intel processors 4GB DDR4 - New and faster DDR4 not older DDR3 15.6 Inch Full HD screen - not some low resolution screen 1TB HDD give you enough space for your files ( if you want you easy may upgrade to SSD drive and boost this laptop performance) This is very nice looking full size laptop - is very thin and light Laptop is coming from factory with Windows installed but now is with Linux Mint. PC Specialist P170SM. The THX™ TruStudio Pro audio technology creates unprecedented levels of audio realism and adds dynamics and punch to every gaming sound and surround effect. This allows faster transfer of HD content. Asus eee pc 901 fully working WIFI READY WINDOW XP SSD CARD WEBCAM. 12GB of Flash-based storage (4GB onboard SSD and 8GB PCI-E mini card SSD). Windows XP. NOTEBOOK Condition. Lenovo’s Ideapad 310 laptop is designed for anybody who wants a dependable laptop at an affordable price. The Ideapad 310 is fitted with a Kensington MiniSaver cable slot to let you securely lock it to an immovable device so it cannot get stolen. LENOVO LAPTOP. SMALL AND COMPACT. X 2 USB PORTS. WIFI:BUILT IN. HARD DRIVE:500 GB HDD. FULLY WORKING ORDER. Type: Notebook/LaptopBrand: LenovoProcessor: Intel Core i3 4th Gen. Condition - 13755 - Refurbished Laptop in Good Condition. Laptop with Windows 10 Pro (UK ENGLISH). This laptop has been cleaned, tested, refurbished. Open Office is installed. It is compatible with Word, Excel and Powerpoint. Sony Vaio Ultrabook svd112a1sm. Condition is used. This ultra book has a fault in the screen as can be seen from the pictures, but is still useable. It comes with a digitiser stylus and 2 mains power adapters. I have reset this computer back to factory settings. Lenovo 310-15ISK Cheap 15.6" Laptop Windows 10, 6th generation Intel Core i3-6006u processor 2.00GHz, 15.6" HD display, 8GB RAM, 1TB /1000GB Hard drive, DVDRW, Bluetooth & WiFi, HDMI & USB 3.0 port, Built in webcam, Battery holds charge. good condition. One tiny spot (see in last picture) hardly noticeable during normal use. Lenovo Ideapad 310 15.6" Intel Core i3 Laptop, 8GB RAM, 1TB HDD, DVDRW, Wind 10. Brand: LenovoProcessor: Intel Core i3 6th Gen.
ASUS G46VW. Core i7, 2670QM. 8GB Ram 1600MHZ. Keyboard with Small Enter Button for HP Compaq 697529-001 603800741001 Condition is Used. Dispatched with eBay delivery – Shutl 1 day. Collection station availableType: Notebook/LaptopBrand: HPProcessor: Intel Core i5 5th Gen. Title: Samsung Galaxy S7 Edge 32GB. - Samsung Galaxy S7 Edge 32GB Gold - Cracked Screen. This is for the sale of a working S7 Edge that has a cracked screen. Warranty information can be found at the bottom of every product’s page. Rapid 128GB Solid State Disk (SSD). Lenovo Ideapad 310-15IKB 15.6" Laptop. Windows 10 Installed and ready to go with Lenovo Software bundle. See high-res pictures are of the actual laptop for sale. 1x USB 3.0 ports, 2x USB 2.0 port, 4-in-1 Card Reader, 1x HDMI-output, 2 in 1 Audio Jack, 1x RJ45 (LAN), 1x VGA output. Motherboard is still inside. Untested good for spare parts. Top right corner of screen casing has a light crack dose not effect the screen at all cooling vents cut out around the fans bottom casing other than that in very good condition. This is a powerful laptop. Nvidia Geforce 920MX 2GB. Dependability and Affordability in One. 1TB Hard Drive. Windows 10. MICROSOFT WINDOWS 10. USB 3.0 Port. Affordable Performance. HP EliteBook 2540p Notebook PC 1 and productive on the go—without getting weighed down. Starting at just 1.5 kg, the durable HP EliteBook 2540p is HP’s smallest and lightest EliteBook, designed for maximum portability and uncompromised performance. Type: Notebook/LaptopBrand: LenovoProcessor: Intel Core i3 5th Gen.
GradeB - LENOVO Ideapad 310 Laptop - Intel® Core™ i3-6006U 4GB RAM 1TB HDD 15.6"
Windows 10 also includes Cortana, your digital personal assistant. The more you use Cortana, the more personalised your experience will be. The Units carry a 3 Months Warranty for Peace of Mind. Lenovo Ideapad 310 - 80SM01MAUK. 4 out of 5 stars - GradeB - LENOVO Ideapad 310 Laptop - Intel® Core™ i3-6006U 4GB RAM 1TB HDD 15.6"
10 product ratings10 product ratings - GradeB - LENOVO Ideapad 310 Laptop - Intel® Core™ i3-6006U 4GB RAM 1TB HDD 15.6"
It's a heavy laptop being so powerful but I happily use it on my lap or perched on the arm of the sofa. On the mouse pad left button there is a tiny scratch of black paint missing, on the back of the screen there is a little mark near the stickers, I can see it in the photos! Dell Latitude E7250 Ultrabook TOUCHSCREEN. 256 GB SSD Hard drive. 12" screen. Windows 10 Pro. Screen Resolution 1920x1080. Brand: DellProcessor: Intel Core i7 5th Gen.
Lenovo 320S-14IKB 80X4. 4GB Ram and the super fast 128GB SSD. Hard Drive. Optical Drive. Will the laptop I receive have a UK Keyboard?. Make / Model. 14" 1366x768. Can I collect the item?. Processor Type Core i3. Form Factor Notebook. Hard Drive Size 1000 GB. Color Silver. Lithium Battery Energy Content 30 watt_hours. Average Battery Life (in hours) 4 hours. Item model number 80SM01MAUK. If you want to browse the web, work and watch the latest shows, the IdeaPad 310 is an ideal choice. Processor boost frequency 2.8 GHz. HD type Full HD. With a Full HD screen, this laptop is perfect for watching movies or going through your favorite photos. Small crack in top left corner. See photos. Full working order. Full factory reset and deep hard drive erase. 2000GB HDD. Hard Drive 2000GB. Lenovo Ideapad 310. Solid State Drive No SSD Storage Included. Optical Drive DVD RW. Integrated Graphics. LENOVO IdeaPad 31. If you want to browse the web, work and watch the latest shows, the IdeaPad 310 is an ideal choice. Processor boost frequency 2.8 GHz. HD type Full HD. With a Full HD screen, this laptop is perfect for watching movies or going through your favourite photos. Energy Efficiency features - All 8000 Elite models have improved energy efficiency over previous generations by 30% when the PC's are at an idle. Take efficiency even further with low power processors and energy efficient power supplies. Design Colour colour : Glossy black finish on display lid and matt black palmrest, both with textured pattern, black keyboard. type : Toshiba TruBrite® WSVGA TFT High Brightness display with 16 : 9 aspect ratio and LED backlighting. Display: 30,8cm (12") Aktiv TFT 1024x768. Gehäuse: Leichtes Gehäuse / aus Magnesium, sehr robuste Bauweise -. Schönes Bild auch an der Sonne, Auflösung 1024x768XGA, mit Touchscreen, spritzwasserfest - es macht dieses Notebook zum idealen Kassencomputer für unterwegs, sowie wird Sie auch als Urlaubsnotebook sehr freuen! Windows 10 also includes Cortana, your digital personal assistant. The more you use Cortana, the more personalised your experience will be. Getting the Right Products for You Each and every order you place is checked by one of our experienced sales team.